I first discovered Jenny Lawson (aka The Bloggess) on twitter sometime last year and from there, her blog. The first story of hers I ever read was the story of Beyonce, the 5 foot metal chicken. Upon reading that story, I was instantly hooked on Jenny and her blog. I loved (love!) Jenny’s written voice - how she can be vulgar and self-deprecating and honest, all while making you choke on your coffee from bursting out laughing. Seriously, don’t eat or drink while reading her blog or her book. But I think what so many of Jenny’s fans love about her, is the fact that beneath it all, she’s really just one of us. A little crazy (because really who isn’t? ), a little very foul-mouthed, a little depressed, and a childhood full of embarrassing memories. She’s relatable and is able to find the humour in life that I wish I could write about as beautifully as she can. So needless to say, when she started tweeting about her book that was close to be published, I was so excited! I wasn’t sure what to expect from her book, to be completely honest. While it’s classified as a ‘mostly true memoir’, it could easily be shelved in the humour section. It’s up to you to decide for yourself what’s true and isn’t true, but I think it’s fair to say that stuff this crazy can’t be made up. Let’s Pretend This Never Happened is essentially a scatterbrained compilation of essays. There’s no flow or noticeable order to the stories, but it works. She talks about everything from her crazy childhood growing up with a father obsessed with taxidermy; how she met and then married her husband, Victor; their constant (but hilarious) bickering and bantering, complete with an argument captured solely on post-its; her struggles with conceiving their daughter, Haley; vaginal arthritis and of course, Beyonce. I did a little shout of joy when I got to the Beyonce story. If you have no idea what I’m talking about you need to read this story here. I devoured the book in a few sittings and made anyone within earshot listen to me re-read my favourite laugh-out-loud bits. If you are a big fan of The Bloggess like I am, then chances are you’ll have a hard time putting this book down. But this book would be also be a great “side” read – a book you can pick up and read a chapter here or there when the mood strikes. I also REALLY want to listen to this book on audio now. I've heard it's fantastic and I can only imagine it's even funnier listening to Jenny read it. My only complaint with this book was the black and white photos. They were too small and it was hard to make out what was in the picture. I want big, colour pictures next time, Jenny! "Hey, Grandlibby?" I asked. "What's a 'turn-on'?" She paled visibly, looking mildly ill. "Well," she said...struggling for words, "it's...um...the things that make you happy, I suppose?" I turned to my cousin. "My turn-ons are Rainbow Brite and unicorns." Michelle smiled back, her two front teeth missing. "My turn-ons are Monchhichis. And Tubble Gum." Grandlibby issued a terse, strangled laugh. "Yeah. I could be wrong about that. I don't speak real great English, you know. Why don't you just never use that phrase again, okay?" Haha! 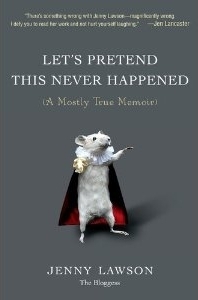 I've seen this book in stores and the little mouse on the cover makes me giggle. Is it just random or is there a connection with one of the stories? I keep wanting to read this one! I have heard that unless you're a fan of the Bloggess, you might not enjoy it as much. I've been to her website a few times, but wouldn't say I follow her religiously. Still ... might have to see if the library has it! I do love the cover -- it's very cute! She tweeted the other day that she just turned in her proposal for her second book!! This only just came out in the UK and I am STOKED! Ok, I've seen this everywhere and didn't know what all the fuss was about. It sounds like the type of humor I so desperately need in my life right now.